another KowalVate moment. संपादन करे Again '3' : i don't think kowalski and private gay. i post this picture because i प्यार when kowalski being brotherly to private. so, don't think negative first if yu wan't to टिप्पणी दे ^^;. enjoy. Wallpaper and background images in the पेंग्विन्स ऑफ मॅडगास्कर club tagged: penguins of madagascar kowalski private. It's time for my point of view!!! Kowalski is being lovely to Private. Lol he artichoked a ukuklele private! .............. im just gunna say any pairing with kowalski in it 2 me is... stupid..! I don't like the gay pairings some people make... I mean, Look at Lt_Kowalski's comment! He's sickened!!!! SICKENED!! please don't say that ^^. if you hate it, why do you comment ? In a way thats cute and its mostly ewww. Kowalski get a girl for pitys sake. But yes, him being a big brother would be much more cute then him being a gay partner. So, all i can say is all hail K-dogg!!!!!! Like Blue_Vanilla said, if you don't like it, don't comment! Orsay something for what else they could be doing! And we know Kowalski's not gay. It's a purely fanon pairing. 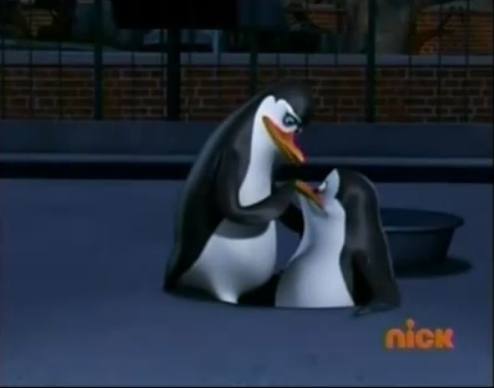 Nah, Kowalski isnt gay.....but he should try gettign a girl so OTHER people don't get the wrong idea. And no I dont think of him as gay. Of course not, never. The 2nd penguin of gorgeousness shouldnt be gay so he isnt. :p idk, anyway what i mean is, he is perfectly straight. that's okay, i don't think kowalski and private gay. i post this picture because i love when kowalski being brotherly to private.